The tallest building in the city today was built as "Torre Agbar". The word "Agbar" is made up of the Castilian Aguas de Barcelona or Aigües de Barcelona in Catalan. Aguas de Barcelona is the municipal water company which today belongs to the Grupo Agbar. The holding consists of a total of 220 companies serving several sectors of the urban infrastructure. The Torre Glòries was built by the Grupo Agbar and houses its headquarters. Since water is the focus of the Augas de Barcelona, the tower represents a water fountain that constantly changes its appearance. Depending on the incidence of light, the tower changes its colours - the coloured aluminium sheeting that reflects the light consists of 40 different colours of high gloss. In front of this layer the wall is clad with thousands of glass louvres that serve as a sunscreen and can be inclined at various angles to guarantee a maximum reflection of solar energy. The space between the façade layers allows a natural circulation of air in the building. 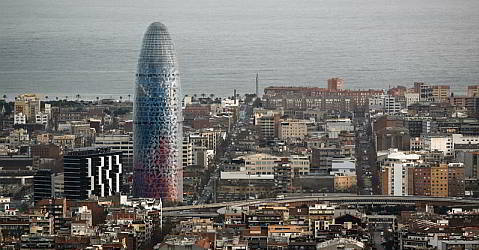 The Torre Agbar was designed by the French architect Jean Nouvel in association with the company b720 Arquitectos from Barcelona. It is said that Nouvel was inspired by the organic forms of Gaudí’s buildings in Barcelona and by the hills of the Montserrat. The building is often compared to a geyser reaching the sky above Barcelona. At this moment, the Torre Agbar is the highest building in Barcelona. Only the Sagrada Familia will surmount it once the construction works are over - the building regulations in Barcelona do not allow any other building to be taller than the Sagrada Familia. When the tower is illuminated at night, it is extremely impressive. During the illumination, the 4,500 illuminated glass panels constantly change their colours. The spectacle can be enjoyed best when not standing too close to it. Also at other times the Torre Agbar will be illuminated. The platform of the office building is not opened to the public, so unfortunately it is not possible to enjoy the view on Barcelona from up there. However, there's an exhibition in the lobby of the tower, displaying the history of water treatment in Barcelona.Wheter the viewing plattform or restaurants will be public after the conversion by the new investor is not known yet. In 2013, General Aguas de Barcelona sold the building to investor Emin Capital, who wanted to run a Grand Hyatt hotel in it. Several restaurants were to be built into the building and the viewing platform would be open to the public. However, the city administration did not issue a building permit for a new hotel. The building was then sold to investor Merlin Properties for just € 142 million in January 2017. The selling price is therefore € 108 million below the price Emin Capital paid for it at that time. The former Torre Agbar seems to have become a shop keeper as Torre Glòries. The City of Barcelona has applied for the European Medicines Agency (EMA) site. Due to the political uncertainties in October 2017, however, Barcelona did not get the bid for the location. Parts of the building are now rented as offices, Merlin will probably rebuild and modernize and expand the Torre Agbar to a large office building. Whether parts will be publicly available is not yet known. The visit of the viewing platform is not possible.